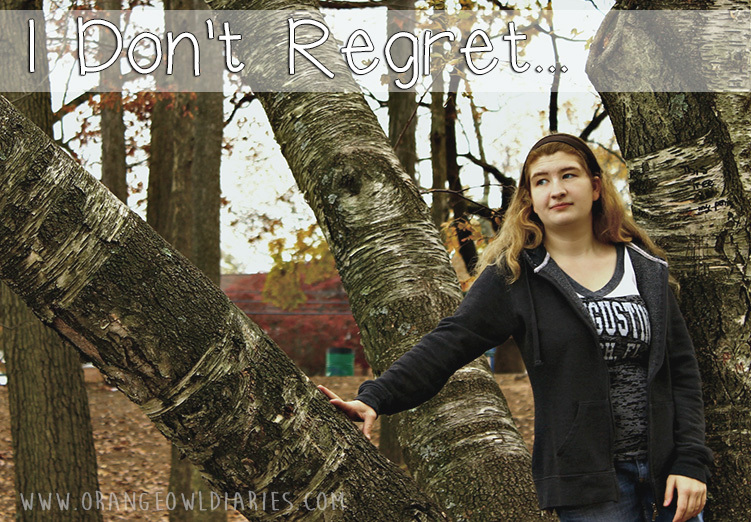 Even though we try to avoid them, we can’t help but to have a few regrets in life. Maybe they’re minor – that compliment you wish you said aloud – or they can be major regrets – not spending enough time with a special person. We even find ourselves regretting things we had no control over in our past. You know the saying, “If I had known then what I know now, things would be so much better.” It’s silly that we have that kind of regret, but we do. However, I specifically remember one thing that I was told I’d regret, yet… I don’t. The spring of 2009 the seniors of my high school were preparing themselves for prom – buying dresses, renting tuxedoes, getting their tickets, asking out dates… you know, prom things. Of course, there were a few seniors that weren’t nearly as concerned with prom as the rest of the class. Prom was never something I’d fantasized about. So while my best friend was preparing herself for prom she continued to tell me that I’d regret it if I didn’t go. I might not regret it right away, but down the line I would. I kept telling her she was wrong, I wouldn’t regret it. In fact, if three was anything I regretted at the time, it was going to the junior ring dance (or junior prom) the year before. Going off that experience, which was also my first school dance ever, I knew there was no way I was going to senior prom. School dances just weren’t my scene, and even the one dance that is pretty much a milestone in high school wasn’t going to change that. I was adamant about skipping prom in favor of staying home and relaxing, and possibly writing stories of some kind. Now, my high school prom was six and half years ago and guess what? I don’t regret not going. Sure, I might not remember what I did that June night… but it’s better than remembering having a miserable time at senior prom because I didn’t even want to be there in the first place. Did you go to your prom? If you didn’t, do you regret not going? Funny. I’m the type of person that would avoid prom. The whole getting dressy, hair, makeup, dancing thing isn’t really my thing, but I went. I went with a bunch of friends and it remains one of the best times I’ve ever had. Its so ironic. Oh geez, that bites. I’m really happy people are in the same mind-set as I am about prom. I’m sure it’s fun for others, but we’re just not the types to go. And I’m glad that girl was okay!